5. Hornpipe from "Water Music"
Play the violin at weddings, special occasions, retirement homes, corporate events. Zhenya did an amazing job at our small wedding ceremony. She plays with absolute feeling, and sounded so beautiful. I'm so glad we found her; her repertoire and professionalism are unparalleled. Zhenya is a must for your event! Zhenya was a wonderful edition to our daughter's wedding day! Couldn't have been more perfect. Highly recommend. Zhenya's violin play was divine. Zhenya played at my wedding and reception, and her play was divine. I wish I had heard more but was preoccupied with speaking to guests. I had her play at my wedding during the ceremony. Her music was incredible!! Highly recommend! An Excellent Addition To Our Wedding Ceremony! Zhenya was wonderful to work with as we planned our wedding. She was open to our music suggestions/requests and was flexible with the flow of the service. Her prelude filled the sanctuary with a beautiful sound as guests were seated. Her renditions of You Raise Me Up, Can't Help Falling In Love, and Canon In D were very well received during the processional. It was clear she had done this before - we did not have an official wedding coordinator. But, Zhenya was able to follow small cues to play the appropriate song. This alleviated so much stress during the day. Thank you for bringing music to our special day, Zhenya! I highly recommend Zhenya. She is an accomplished musician, very professional, and a very nice person. Zhenya was responsive and easy to work with. She was professional but also warm. We had a great time with her! Zhenya was a complete joy to the residents. She was responsive, informative and very gifted. Her interaction with the residents was delightful and pleasant. We can’t wait to have her perform again. Zhenya entertained my guests with her beautiful violin performance during the wedding reception of my son. She played some fine and captivating music and kept party alive, I would strongly recommend her to anyone looking for a great violinist. Zhenya performed at my wedding in October and I can't say enough about how happy we were to have her. She was very professional and her music was beautiful. She was always available via phone/email ahead of time for any questions/concerns we had about the arrangements. I couldn't have been happier with the violin playing that Zhenya provided for our wedding. It was gorgeous, she played exactly what we wanted and the guests commented on how much they loved it. I would recommend her to anyone. We could not have been happier with Zhenya. We enjoyed working with her every step of the way from the initial booking to her playing at the wedding. She is an exceptional violinist, and all of our guests were commenting on how wonderful she played. She was the perfect addition to our wedding ceremony. I would highly recommend booking her if you are looking for a fantastic violinist and lovely person to work with! Zhenya did an excellent job! She is very talented and played all the wedding music we requested. She was provided with a time line for the day of the wedding, however nothing went as planned and she acted as a true professional and simply went with the flow. She had and needed essentially no direction for our wedding. I highly recommend her and thank her for the beautiful music and being so flexible. Zhenya was a pleasure to work with, from start to finish. 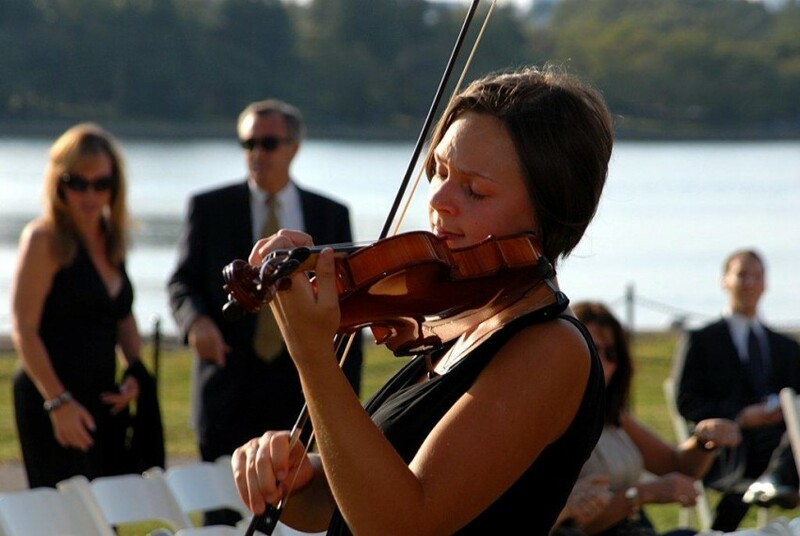 She played as a solo violinist for our outdoor wedding ceremony and we are so happy to have had her as a part of such an amazing day. She is a true professional-- she was timely and played the music we requested (and did so beautifully!). We couldn't have asked for anything more and we would have her again in a heartbeat. Thank you, Zhenya for agreeing to play at our wedding, you are wonderful!!! Working with Zhenya was absolutely amazing! From our first introduction up to the wedding she was great! She played beautifully, and brought such an elegant touch to our special day. She played Ave Maria and while I walked down the isle she played A Thousand Years. Just beautiful! Thank you Zhenya. Zhenya played for my wedding and was easy to work with, on time, and most important, a beautiful violinist. I couldn't recommend her highly enough! Very professional, and talented. Enjoyed by all. Zhenya Zianouka ensures the highest level of performance to create an elegant atmosphere, adding a lovely touch to your special occasion. Zhenya Zianouka is a graduate of the Oginski School of Music in Belarus, where she studied violin, piano, music theory and history. She is a member of the American String Teachers Association, and holds a degree in Violin Performance from Hood College, MD. She has performed professionally in Europe and the United States.